Livny Pigs are a general purpose pig from the Orel region of Russia. They were developed by a team of specialists from the Livny Breeding Ground. Selective pedigree work was carried out on the basis of the cross-breeding stock, which was formed before 1917 by random outbreeding of local late-ripening pigs with Berkshire, Large White, Middle White, and Polish-Chinese pigs. 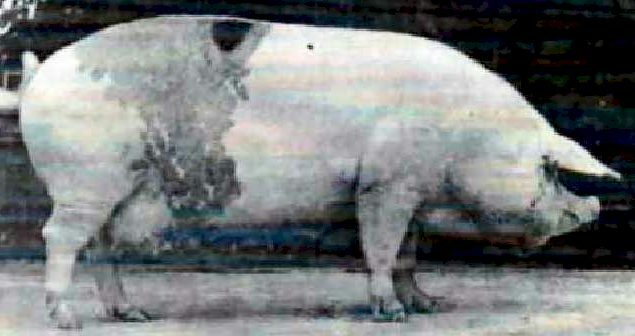 As a result of monitoring 10 lines of boars and 28 breeding families, pigs improved for these parameters were obtained for productivity, precocity, and conformation, and in 1949 the name Livny breed was legally fixed. They have good adaptability to natural and fodder conditions of Russia, as well as produce high quality meat. Livny pigs make good use of pastures and diets with a lot of bulky fodder, chaff and potatoes. Livny pigs are well adapted to the conditions of the central regions of Russia, perfectly adapted to pasture maintenance. Rations of these animals are dominated by coarse, juicy feed, potatoes and cereals. With a body length of 160 - 175 cm they are quite massive. Their head is short, broad, and has a characteristic snub-nosed snout. They have think and large drooping ears. Their back is wide and straight. Their skin is folded, loose, and completely covered with bristles. Their belly is somewhat saggy. Their coat is predominantly white, but also black and white and reddish-black in areas.